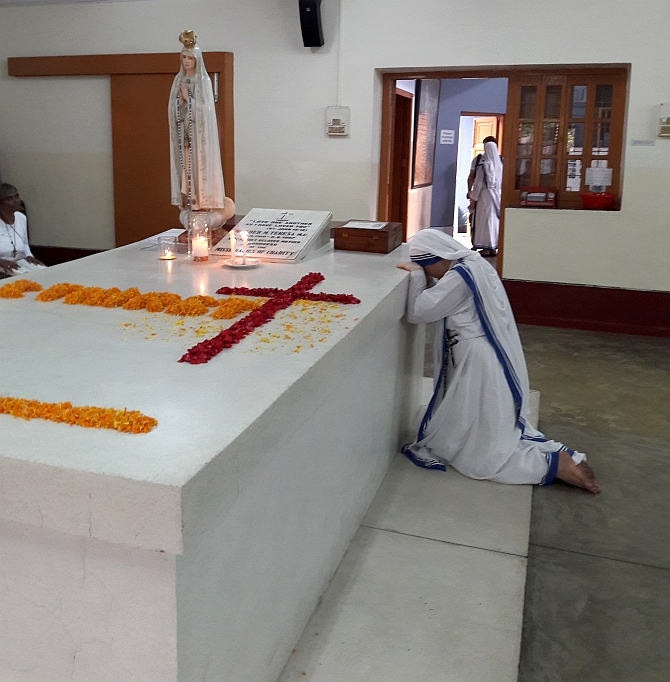 Payal Mohanka reports for Rediff.com from the Missionaries of Charity in Kolkata. A pencil-thin alley leads to the main entrance of Mother House, the 4-storeyed grey building with brown-shuttered windows. 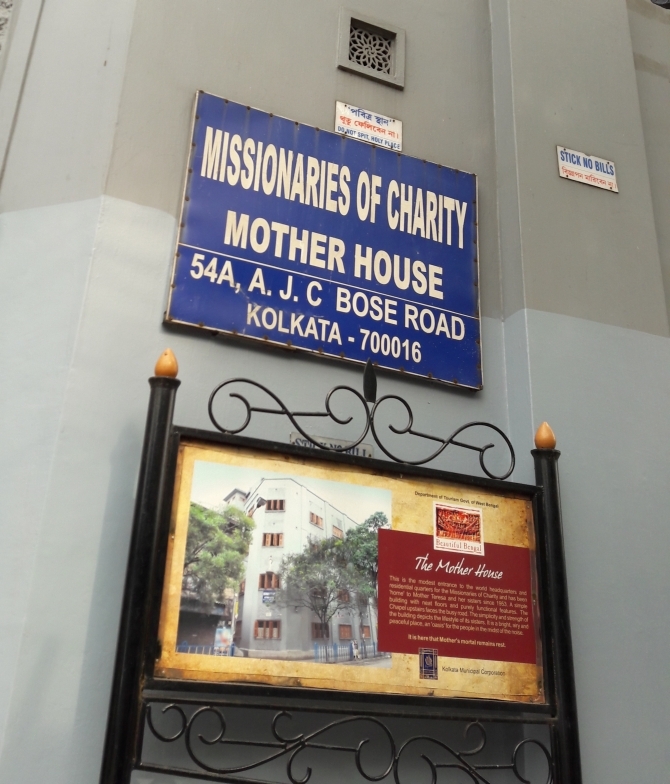 54A AJC, Bose Road in central Kolkata -- the worldwide headquarters of the Missionaries of Charity, the order founded by Mother Teresa -- radiates peace and a palpable sense of energy. On Sunday, September 4, St Peter's Square in Vatican City witnessed a historic event as Pope Francis canonised Mother Teresa who made Kolkata her home and served the 'poorest of the poor'. Sister Blessila, who is supervising arrangements at Mother House, remembers the one quality of Mother she most admired. "Mother lived in the present moment. It was all for Jesus. That was Mother. She was Mother to all. For us she was already a saint. We have lived with her." 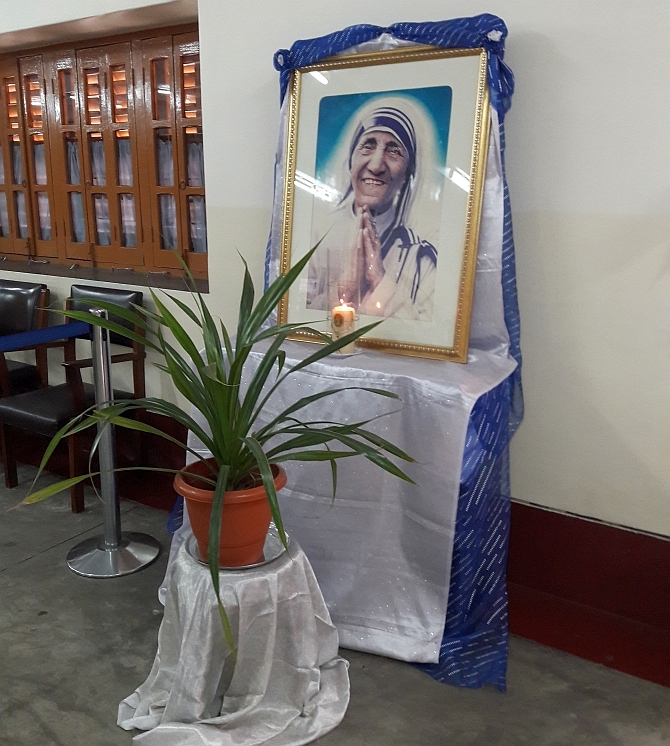 Born in Skopje, Mother Teresa came to Kolkata as an 18-year-old Loreto nun and made the city her home. She stayed on in the city till her death in 1997 selflessly served the sick and the dying. Today, 5,100 sisters of the Missionaries of Charity and a few hundred novices manage 758 homes in 139 countries. Dedicating their lives to prayer and service, they tend to those discarded by society: Abandoned orphans, dying destitutes and leprosy victims. 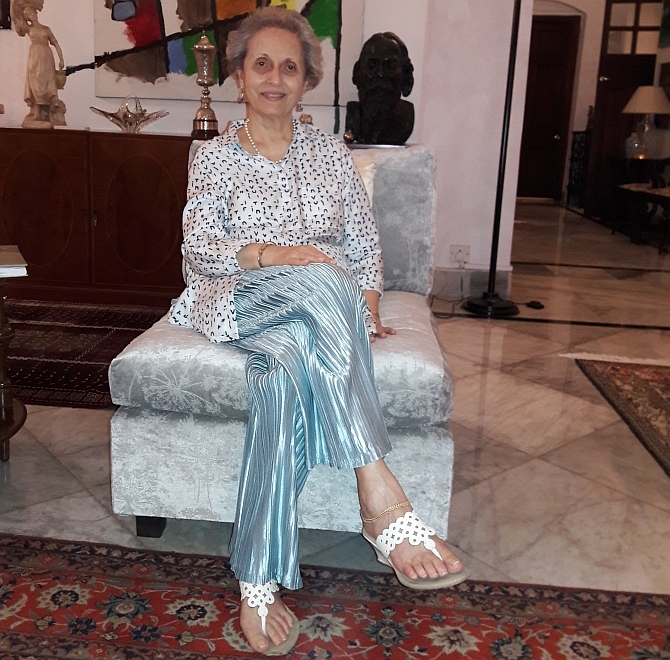 "The Vatican is now putting an official stamp on what I had already known," says Sunita Kumar, the 74-year-old spokesperson for the Missionaries of Charity. "I always prayed that it would happen in my lifetime. I am amazed that the Vatican put her on the fast track for both beatification and canonisation," she adds. The announcement of Mother Teresa's canonisation has filled those who knew her intimately with a sense of joy. And once again brought back memories of her grace and dignity. Kumar, who was associated with Mother Teresa for three decades, recalls her first meeting in 1967. Vivid memories come rushing back. Kumar was at a meeting of co-workers -- a body of volunteers who helped the nuns with various jobs like making packets of medicines for leprosy victims. "Mother would occasionally come to these meetings to familiarise herself with the co-workers. I was introduced to her. We shook hands. I cannot forget the warmth and strength that passed through me. I can't even explain it," says an emotional Kumar. Over the years, they developed a special bond. Kumar diligently followed Mother's instructions. She helped Mother in the office and typed receipts. She would sort medicines that arrived from countries like Switzerland and Germany and seek help from the consulates to translate the instructions. Watching Mother from close quarters, Kumar was amazed at her boundless energy. "She worked in very depressing conditions, she tended to the sick, the handicapped and always did it with a smile." This is what Mother taught the nuns and co-workers. "Over the years, Mother became my role model and a great inspiration. She was a true saint," adds Kumar, also an accomplished artist. In the 1980s, French author Dominique Lapierre became a close associate of Mother Teresa's. He was also given permission by Mother to write a film on her life and the work of the nuns. The film was Mother Teresa -- In the Name of God's Poor. Following Lapierre's visit, the nuns were inundated with requests from the media. This interfered with their work schedule. Mother asked Kumar to become the congregation's official spokesperson, "Mother called me and said, 'Each one of you can help'," remembers Kumar. For Kumar, the role of a spokesperson was not easy. "Mother always said 'No matter what you do, there will always be criticism. Let the critics continue. What is happening in my homes, I know for sure. Give love and care and happiness to the poor.' Mother never got hassled with any criticism." When Christoper Hitchens, a stringent critic flung accusations at her, Mother calmly said, 'I will pray for him'. Mother was criticised for accepting money from those mired in controversy. Once a beggar gave her Rs 5. She accepted it with a smile. Conversions were another area where Mother was constantly attacked. "If an abandoned baby is picked up and they know for sure he or she is a Muslim,"Kumar points out, "the baby is definitely brought up as a Muslim. There is no question of conversion. She was above religion. She looked after everyone." Almost three times a year Mother House holds an All Faiths Prayer. Unperturbed by criticism, Mother Teresa went about her task with humility. She often said that 'her work was just a drop in the ocean'. But those who value her efforts maintain that the ocean would be less because of that missing drop. Kolkata always knew what the Vatican has now formalised.